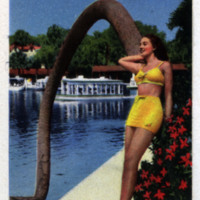 Collection of digital images, documents, and other records depicting the history of Silver Springs, Florida. Series descriptions are based on special topics, the majority of which students focused their metadata entries around. 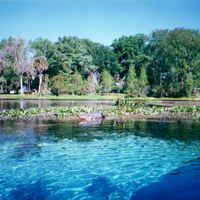 Silver Springs was originally settled by the Timucuans in the early 1500s. Although they were able to reclaim their territory after Spanish invasion, the Timucuans were ultimately succeeded by other tribes, such as the Seminoles. In the 1860s, Samuel O. Howse purchased 242 acres of land in the area around Silver River. 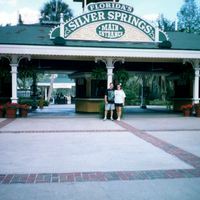 Silver Springs became known as Florida's first tourist attraction beginning with glass-bottom boat (invented by Hullam Jones and Phillip Morrell) tours in the late 1870s. W. Carl Ray and W.M. "Shorty" Davidson of Ocala further developed the land surround the springs into what is now know as Silver Springs Nature Theme Park. Marion County Collection, RICHES of Central Florida. Martin, Richard A. Eternal Spring; Man's 10,000 Years of History at Florida's Silver Springs. St. Petersburg, Fla: Great Outdoors Pub. Co, 1966. Rockwell, Lilly. "Spring woes in Florida." Florida Trend, June 20, 2013. http://www.floridatrend.com/article/15745/spring-woes-in-florida.